There is a new vegetarian restaurant in town but I’m too busy overeating at home in front of the Hollyoaks omnibus to check it out, so Josh has kindly offered to review it for you. I didn’t want to like Ethos. Why? 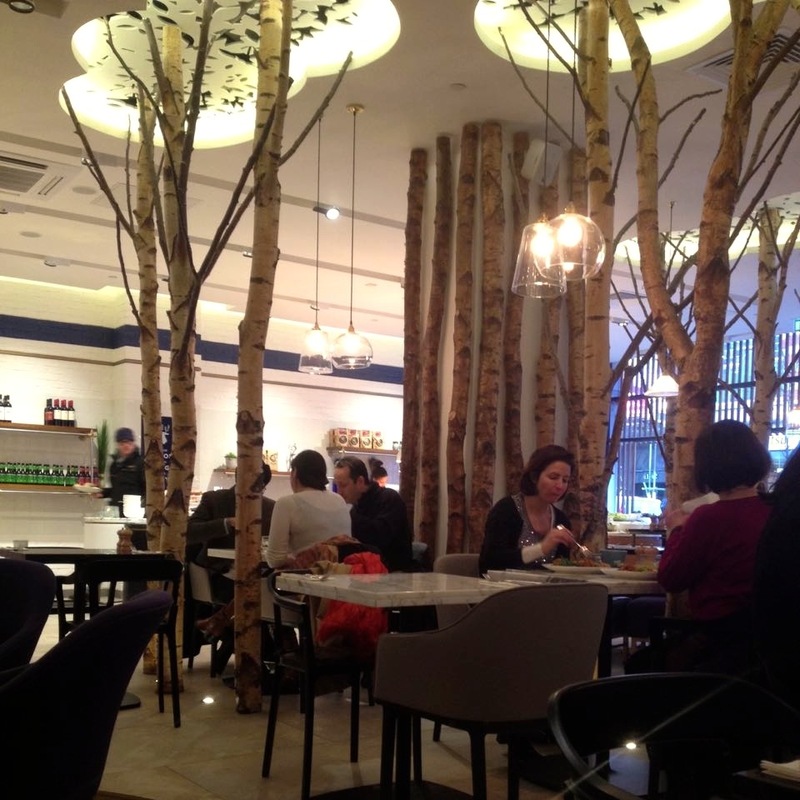 Because London has enough bloody vegetarian restaurants already. We need VEGAN restaurants and lots of them. This city is shamefully under-represented when compared to places like Berlin, Paris, NYC, etc. Anyway, a vegetarian restaurant near Oxford Circus where vegan items are labelled and you pick what you want and pay by weight… sounds familiar right? 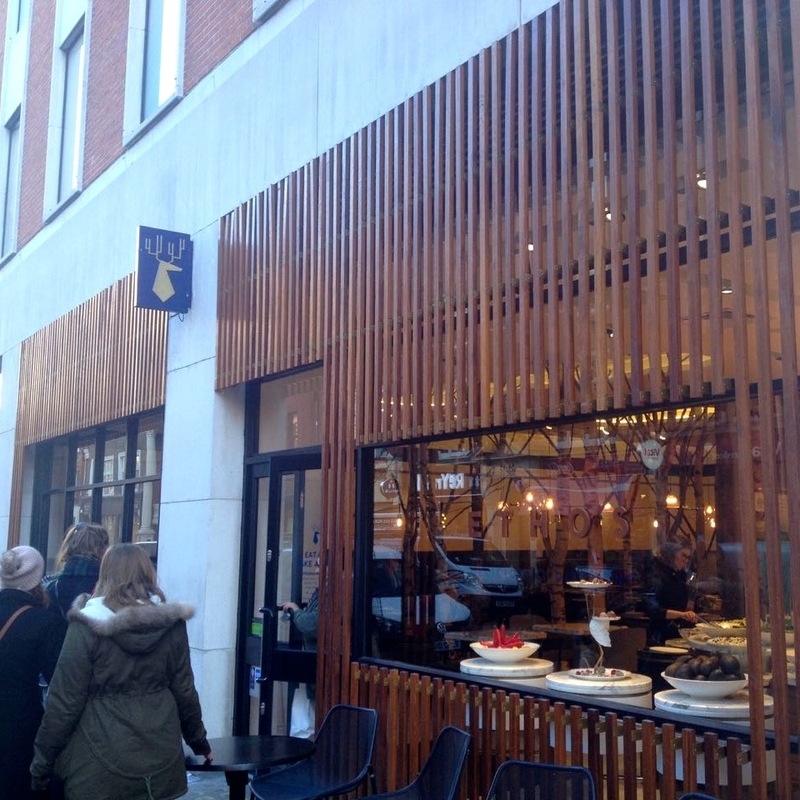 It’s impossible not to compare it to nearby tibits! So, what’s it like? Well, it’s actually quite good. There were lots of vegan options in the savoury food section and the presentation of the dishes was visually pleasing. The food itself was tasty, fresh and well-crafted. It’s great to see a London restaurant using seitan and the Seitan Stroganoff (it’s hidden somewhere on my plate) was particularly tasty. The Seitan BBQ Ribs were a bit chewy and tasteless, disappointingly so as it was one of the dishes I was most looking forward to trying. The salads were of a high standard but a word of warning… it ain’t cheap. My plate (pictured below) was over £17! Now, I know I was a bit greedy and filled it up but it still wasn’t worth that amount. The dessert selection was a little paltry. They could have done with a few more vegan selections. Although I had my doubts, the carrot cake with strawberry icing turned out to be a enjoyable flavour combination. I would go back to Ethos, but not in a hurry. Given the proximity and similarity to tibits, I would probably head there instead as the decor and vibe is a little more relaxed and welcoming. The brightness and openness of Ethos doesn’t lend itself to sitting around and enjoying a glass of wine after you’ve finished your meal. Has anyone eaten with Ethos? Do you agree with Josh’s take on the restaurant or do you have a different view? You can follow Ethos on Twitter. I can;t see mention of it on their website any more, so they may have stopped doing this now, but we went in October to try the Weekend Brunch. All-you-could eat for £17, including desserts, a cold drink & a coffee, until 3pm. They were only doing the one vegan dessert – the tasty carrot cake – back then but were about to offer more vegan options & improve the labelling.to make it clearer for customers. If that’s still on, it’s a nice leisurely way of scoffing whilst reading the papers, magazines & playing board games they have there. I totally agree with Josh! In fact, I could have written this myself had I not been neglecting my poor blog and had they had the carrot cake on offer. 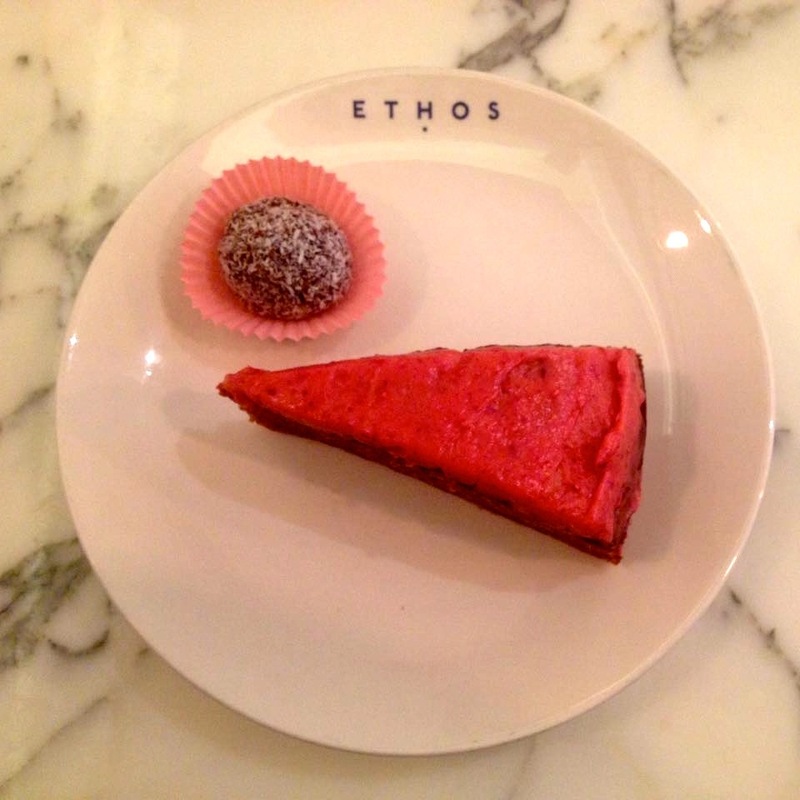 As far as the comparison with Tibits goes, I think I actually preferred the vibe and presentation in Ethos and thought the food was slightly more to my liking. Having said that, I think it is slightly more expensive and I’m not entirely sure the difference in taste/quality is worth paying more for. Having said THAT, I would consider going back for the seitan stroganoff alone. The vegan dessert selection – or lack thereof – is indeed appalling, but I had a berry muffin when I went that was good enough to shut me up. All in all, exactly as Josh said, it was good food and definitely makes vegetarian food more visible and appealing to non-vegetarian consumers, but given the proximity of Tibits I think it is pretty inexcusable not to have made it a vegan restaurant instead! It’s a while since I went but I was pretty unimpressed and haven’t been back. There was a lack of vegan options (esp desserts), poor/inconsistent labelling (two plates of the same dish at either end of the table – one marked vegan and one not, other vegan items pointed out by staff not labelled), 4 dishes were without serving spoons (cross contamination) and the hot food was lukewarm. They didn’t have any seitan on the day I was there, maybe that would have lifted things. Maybe I’ll give it one more try to see if it has improved.